Edit: Thanks to several wonderfully knowledgeable readers who left comments, the “plant” has been identified as a “witch’s broom”, which is actually a mutated growth of the tree itself. Normally found high up in the tree canopy, presumably this one was brought down to eye-level by the toppling of the tree. Witch’s brooms can be caused by many factors, including, but not limited to, infections by fungi or mistletoe. One of the fungi that can cause these deformities belongs to the same genus as the Black Knot that infects Black Cherry and Chokecherry. Similar to a cancerous growth, the fungi changes the growth pattern of the affected cells, causing them to form these clusters of thin woody branches. 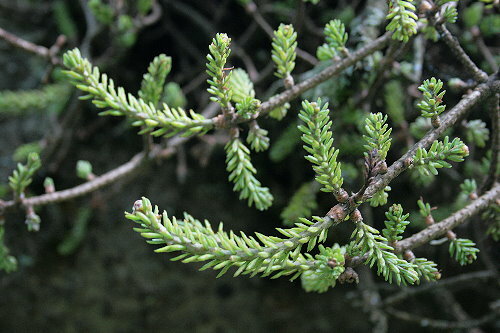 A cutting taken from one of these growths and grafted or rooted will continue to grow in the same form – this has been used to develop a number of the compact cultivars of evergreen often seen growing in gardens. Growths can be malignant or benign, depending on the cause and the tree species involved – some trees can live for decades with a witch’s broom, while others quickly succumb to the infection. I’d never heard of witch’s broom before, thank you to everyone who left comments! Of course, that doesn’t change the validity of my notes here about epiphytes – just it turns out they don’t actually apply to this “plant”. A couple of weeks ago, when I was walking through the forest on the adjoining parcel of land belonging to our landlord, I came across this plant growing on the trunk of a fallen hemlock. It is an epiphytic plant, that is, one that grows “in the air”, without its roots buried in soil. 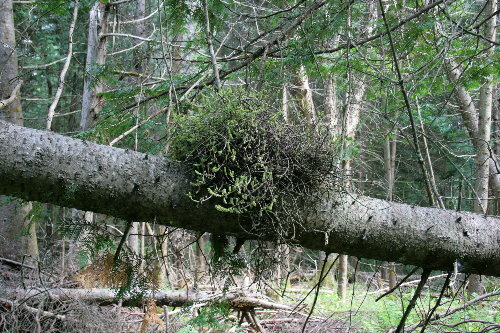 In most cases, epiphytes grow on trees, although some grow on rock faces or other similar substrates. They are generally non-parasitic, using the “host” tree or plant solely for support. The most well-known and familiar of epiphytes, the ones that come immediately to mind, are the bromiliads and orchids of the tropical rainforests. Probably most people associate epiphytes with tropical forests as a result, but they are certainly not confined to those habitats. The group term “epiphyte” actually encompasses a broad range of plants. Anything that grows above the ground without soil as substrate is classified as an epiphyte. This means that many other familiar plants, such as Spanish moss or beard lichen, are in this group. Many ferns, mosses, and flat lichens also qualify. If you go for a walk through your local forest, there is a good chance you’ll see many epiphytes, albeit small ones – older trees often become festooned with lichens and mosses, especially in damp, humid habitats where there is increased moisture in the air. Because epiphytes don’t have their roots in the soil, they must obtain all of their nutrients through rain water. This is also why they favour moist environments – a high ambient humidity prevents their roots from drying out. As the plant grows larger, fallen leaves and debris that collect at its base and begin to decompose may also provide nutrients. The majority of research on epiphytes has been done in the tropics, because that’s where their biomass is greatest, where they’re the most common. Some research has been done on epiphytes of North America, as well, but focus has primarily been on the everglades and mangrove forests of the southeast, and the coastal rainforests of the northwest. Some people may also consider the mistletoes of the arid southwest. But elsewhere seems to have received little attention. I spent hours trying to identify this plant. When I found it in the forest, I expected it to be a simple matter – after all, how could such a large and robust plant have been passed over? An initial search for epiphytes of Ontario yielded nothing useful. I tried changing my search terms, broadening my search area. 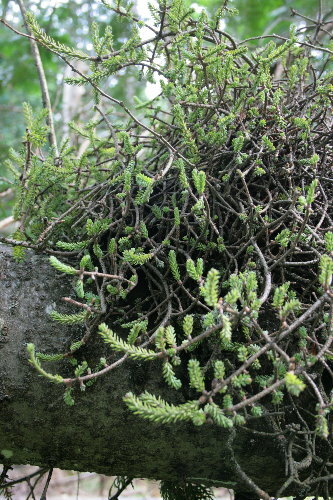 Temperate epiphytes, vascular epiphytes, epiphytes of eastern North America, epiphytes of boreal forests, epiphytes on eastern hemlock. Aside from a few scholarly articles that I couldn’t access, the only results that were even remotely applicable were for research done on epiphytic lichens growing on hemlocks in western North America. At a loss, I emailed the author of that paper to ask if she might know, or know someone. She wrote back to say she didn’t know much about vascular epiphytes, but perhaps to try the botany department of a local university. So I still don’t know its identity. It baffles me that something so large and prominent could lack any sort of a presence on the web. We’re not talking mosses or lichens here, we’re talking a woody plant, a foot and a half in diameter. The animal equivalent would be like a large vertebrate such as a rail or a weasel being passed over because they’re rarely seen. I couldn’t even turn up any information on epiphytes for our region/forests in any of the field guides or reference books I had. All I have to go on is that it’s a vascular epiphyte. Edit: it’s not even that! Although it is vascular. The term “vascular” in animals refers to the blood transport system, the arteries and veins. In plants, it refers to the system that carries nutrients, sugars and water through the plant. In both animals and plants, vascular systems are found only in “higher” organisms, those that have more recent evolutionary lineages. Just like amoebas and insects lack a network of transport vessels for circulation, so do primitive plants such as mosses or fungi. Orchids and bromiliads are vascular epiphytes, having veins and transport tubes. So is whatever this is. I should acknowledge, too, that I couldn’t rule out this plant being a mistletoe. Although when I lifted it up it appeared that it wasn’t secured to anything, I didn’t actually try to remove it. Mistletoes grow above ground in trees as well, but unlike true epiphytic plants, which derive their food from rainwater, mistletoes are parasitic, tapping their host trees for nutrients, sugars and water. I couldn’t find anything conclusive on mistletoes in Ontario, either (photos of the most common mistletoe species for here, Arceuthobium pusillum, don’t seem to match). I’d welcome input from any botanists out there. Gosh almighty! It’s a witches broom! 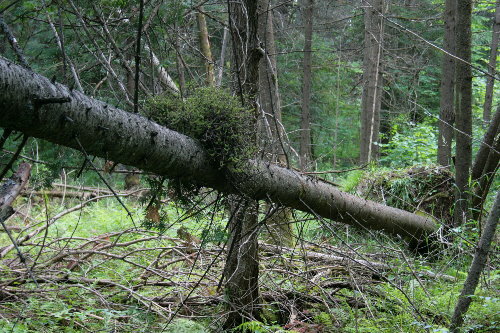 It’s a disease or a deformity that occurs on woody plants and causes that wild looking growth. It could be caused by any number of things and I’ve seen them a lot on spruce and firs. Thanks for helping with the ID, Kirk! I don’t think I would have figured that out just on my own. Pretty intriguing, I’ll have to do more research. Seabrooke, very cool pictures of this witches broom. Usually they are very high up in the trees, so I’ve never seen how interesting they are. Very Cool. We have native mistletoe (Phoradendron) in Southern Ohio, it’s very cool to see large bottomland trees covered with these little leafy shrub like plants in the middle of winter. Thanks, Tom – I’d never heard of this phenomenon and would never have identified it as such on my own. I wonder if it’s just not common here, or simply that, as you comment, they’re usually quite high and I’ve always overlooked them? It will warrant more research, I think. As Kirk and Tom already pointed out, it looks like a witch’s broom, part of the hemlock itself and not an independent organism. Great photos! I wonder if it’s a symptom of what made the tree fall or a symptom of the fall itself–or completely unrelated to the tree’s fate. Thanks, Jason – something new to me! Good question regarding cause or effect, probably one we’ll never know the answer to. Witches Broom, a common growth caused by fungi (as other’s point out) is very often found on highbush blueberries (Vaccinium corymbosum). As you show here it can occur on conifer’s as well. What I don’t know is if it is all the same fungus on the different plant species or individual variations that have adapted to individual species. Wood it be possible to get cuttings from the hemlock witches broom in order to propagated it.